You're touring an open house and the real estate agent running the event walks over to say hello. What should you say in return? Well, you can say hello right back. But other than that, it's best to stay pretty much mum. The agent at an open house is a seller's agent. This individual is paid to represent the best interests of the people selling the home — not yours. If you say too much, you run the risk of accidentally providing them with information that he or she can use against you if you make an offer and eventually enter negotiations to buy their client's home. 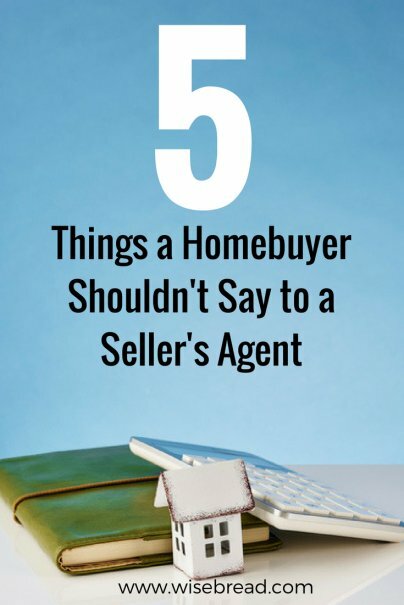 What should you never say to a seller's agent? Here are five conversation gaffs to avoid during an open house. You might think it's natural to tell the agent at an open house how much you love the home you are touring. This, though, can be a big mistake when it's time to negotiate a final sales price if you decide to make an offer. Think about it: If the seller's agent knows that you absolutely love the home, they might be less willing to advise the current owners to lower their asking price. After all, you've already told the agent that the home is a great fit. They might even figure you'll be willing to pay more because you like the home so much. Never let a seller's agent know that you're getting desperate to find a home. This, too, can give an agent inside information that could be used against you. If you tell an agent that you absolutely need to move in the next month, that agent might tell his or her clients that they should hold out for a higher final sales price. After all, you're desperate to move. The seller's agent might rightly assume that you'll be more likely to accept a higher sales price if it means getting into a new home quickly. You likely have an upper limit for how much you can afford to spend on a home. Keep that limit to yourself. Absolutely never share it with a seller's agent. Say you can afford to spend up to $300,000 on a home. Don't comment to the agent that you're excited the house is listing for $290,000 because it's $10,000 under your budget. If the sellers know that you can afford to spend more, they may not be as willing to lower their asking price during negotiations. Share your budget with the agent representing you — your buyer's agent. But make sure it's a secret that the seller's agent never learns. Maybe you're looking for a home because your company transferred you to a new location. Maybe your family is growing. Maybe you've gone through a divorce and you need to downsize. Keep these personal details to yourself. If you share them with the seller's agent, the information you've spread might once again come back to haunt you during negotiations. For instance, maybe you need to move because you're having a baby and once that baby arrives, you won't all fit in your current home. Armed with this knowledge, the seller's agent might advise his or her clients to hold firm on their asking price. They know you're backed into a corner. You need to move to find space for your expanding family, and they have the space you need. You want sellers to view you as a serious buyer. If you share financial struggles with the seller's agent — a past bankruptcy, a low credit score, mounds of credit card debt — you might do the opposite. If the home's sellers think you have financial problems that might prevent you from qualifying for a mortgage (assuming you haven't prequalified), they'll be less willing to enter into serious negotiations with you.